UNITED NATIONS -- The Trump administration shot back at North Korea on Thursday, sending evidence to a U.N. committee showing that North Korea "breached" U.N. sanctions by surpassing the annual cap for refined petroleum products, documents obtained by CBS News reveal. The evidence was sent to the U.N. with a cover letter, submitted from the office of U.S. ambassador Nikki Haley, and called for the committee to circulate the evidence to all 193 member states, asking them to halt the "illicit ship-to-ship transfers" and to "exercise enhanced vigilance" against the North Korea purchases. The report sent to the sanctions committee included a chart of North Korea tanker deliveries of refined petroleum products delivered to Kim Jong Un's government between Jan. 1 – May 20, 2018 and gave estimates that could have been up to 1.4 million barrels if the vessels were 90 percent laden, illustrating the breach of the 500,000 barrel cap established by U.N. sanctions. 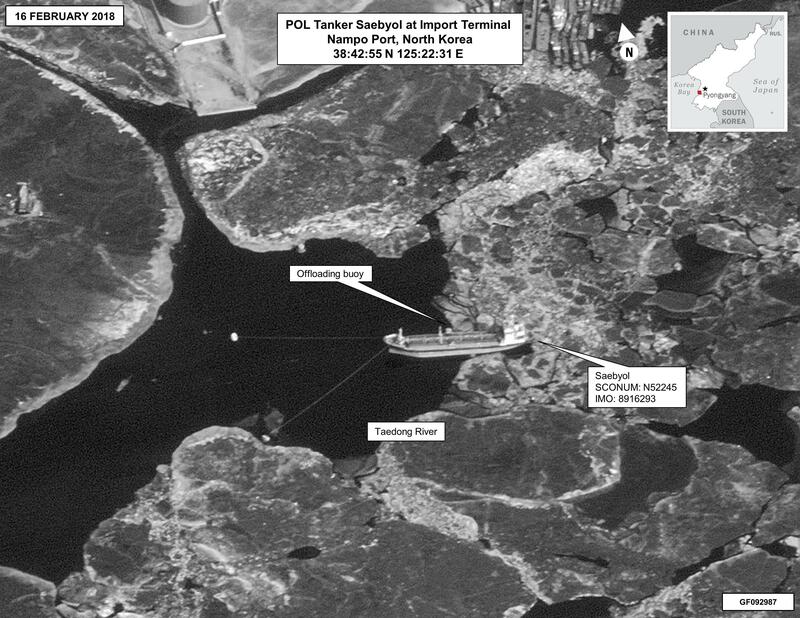 "We are providing for your information data on each of these port calls along with examples of a few selected images of individual DPRK [North Korea's official name] tankers calling into port to unload refined petroleum products," the report states, and added some satellite pictures. The U.S. report to the U.N. also said that North Korea "tankers have called in port in the DPRK at least 89 times likely to deliver refined petroleum products illicitly procured." The U.S. report also takes some countries to task, China and Russia in particular, that have reported to the U.N. that they continue to sell refined petroleum products to North Korea. "These sales and any other transfer must immediately stop," the U.S. said. The U.S. report came on the same day that President Trump tweeted a "very nice note" from North Korean leader Kim Jong Un. The U.S. attempt to enforce existing sanctions comes as a senator on the Intelligence Committee asked for a U.S. intelligence assessment as to whether North Korean actions regarding denuclearization are consistent with the Trump administration's claims. "The first image shows the DPRK-flagged M/T CHON MA SAN moored at the import terminal of the Nampo Port facility in the Taedong River on January 21, 2018, likely in the process of delivering refined petroleum products procured via illicit ship-to-ship transfer. The DPRK-flagged M/T CHON MA SAN moored at the import terminal of the Nampo Port facility in the Taedong River on January 21, 2018, likely in the process of delivering refined petroleum products procured via illicit ship-to-ship transfer. This image shows the DPRK-flagged M/T SAEBYOL anchored at an offloading buoy at the Nampo Port facility in the Taedong River on February 16, likely in the process of delivering refined petroleum products procured via illicit ship-to-ship transfer. The DPRK-flagged M/T SAEBYOL anchored at an offloading buoy at the Nampo Port facility in the Taedong River on February 16, likely in the process of delivering refined petroleum products procured via illicit ship-to-ship transfer. The third image shows the DPRK-flagged M/T YU JONG 2 anchored pier side at the Nampo Port facility in the Taedong River on March 27, in the process of delivering refined petroleum products procured via illicit ship-to-ship transfer. The fourth and final image shows the DPRK-flagged M/T WAN HENG 11 anchored pier side at the Nampo Port facility in the Taedong River on April 16, in the process of delivering refined petroleum products procured via illicit ship-to-ship transfer." A senior U.N. Security Council diplomat told CBS News: "This is concerning but not very surprising as U.N. experts have in the past identified a pattern of circumvention of sanctions by North Korea." "In the current context, it confirms that we need to remain vigilant and strictly implement all the provisions of U.N. resolutions," he said.